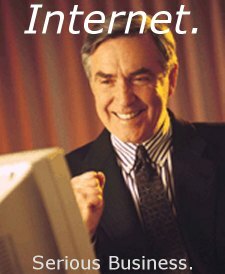 Tips to have a better and more comfortable time on the internet. Today I’m giving you few tips that -when followed- will cause your head to radiate “INTERNET EXPERT” like a big, bright neon sign. Just kidding, It won’t! Never ever use the terms “AOL” and “Internet” as if they were completely the same! AOL, your facebook or your school account is NOT the Internet nor your website; AOL is simply one of many browsers that allows you to surf the Internet. It is also a company that likes to put holographic CDs covered with infomercial-like promotions in post offices in attempts of persuading more people into using their services. So please stop doing that and you’ll avoid people eyerolling behind your back. When you’re surfing the Internet, you likely get from place to place using hyperlinks (a.k.a. “links”). You should be aware that links require NOTHING more than a single click from that left button of your mouse. Double, triple . . . or quadruple clicking and right-clicking on links will not do anything!! Remember that search engines are for searching, not for typing in complete URLs. This means that you do NOT need to go Google or Yahoo Search to reach the specific website you already know and want to visit. Like going to Google.com, Search for youtube.com and click the first result. Instead of typing “www.google.com” into your address bar and then typing in the URL of the site you want to visit in the search box. . . just SKIP going to Google and type the URL of the site you want to visit in the address bar instead!! Profit = Time and at least you won’t look as dumb. I will not go geeky this time explaining what exactly downloading means in a technical way because that would break the rhythm of this post. the term ‘downloading’ means that you pull/copy files off the Internet onto your computer and become able to use them when you need/would like them. PS: Filling applications and other stuff are not “downloading”. Stop using Internet browser that are older than your kindergartner. Welcome to to the year 2010! Dear sir, Using Netscape 1.0 (born in 1994) or Internet Explorer 2.0 (born in 1996) or even AOL or Internet Explorer 5 to navigate the web does not help your overall Internet experience all that much. consider downloading and using something a bit more recent, such as Firefox 3, or Google Chrome. A) You’re the sites 1,000,000th visitor! C) Says that you’ve been randomly chosen from all site visitors to win $100, etc. D) Asks you to kill the pirates before reaching your ship. Don’t worry, the pirates will keep coming and you’ll never die! Internet experts know that those type of advertisements are nothing more than huge wastes of time. Are you stuck with something? And can’t think or anything that can provide support, Just use Google; Google knows everything! And those, my friends, were few tips that should help you on your way.